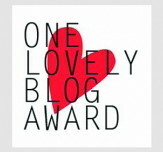 So this was actually just going to be a normal blog post, but thinking about it I decided that this would be a great Getting Started post. 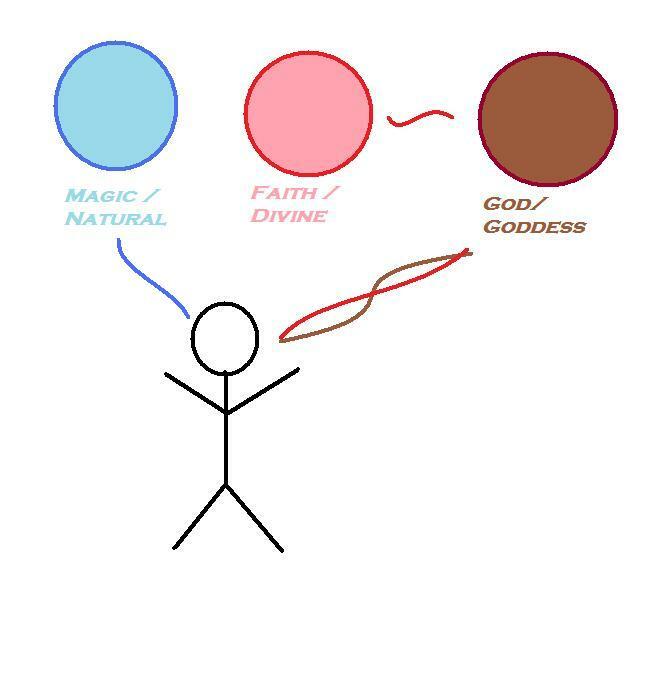 Since the main idea about the Getting Started series was about an introduction to the Germanic religions without necessarily the magic, but focused more on faith, I think this is an important discussion since a) so many come to Polytheistic faiths through magic and b) most people don’t realize that faith and magic are both similar and different. This was also inspired by this post over at Musings of a Hedgewitch. She comes to the conclusion that spells are prayers. This is my view. However, there is another power source out there, we’ll call it Faith. Faith rises from a different source, we’ll call these Divine Forces. Now Faith works a fair bit differently than Magic. 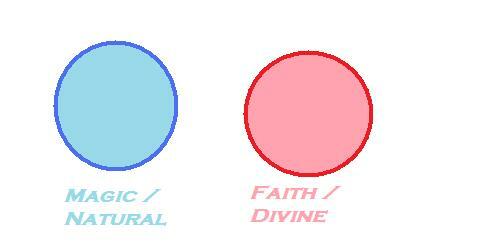 For one, you have to believe in the Divine (be it in multiple Gods or just one). This belief connects you to the Divine Beings that are out there. 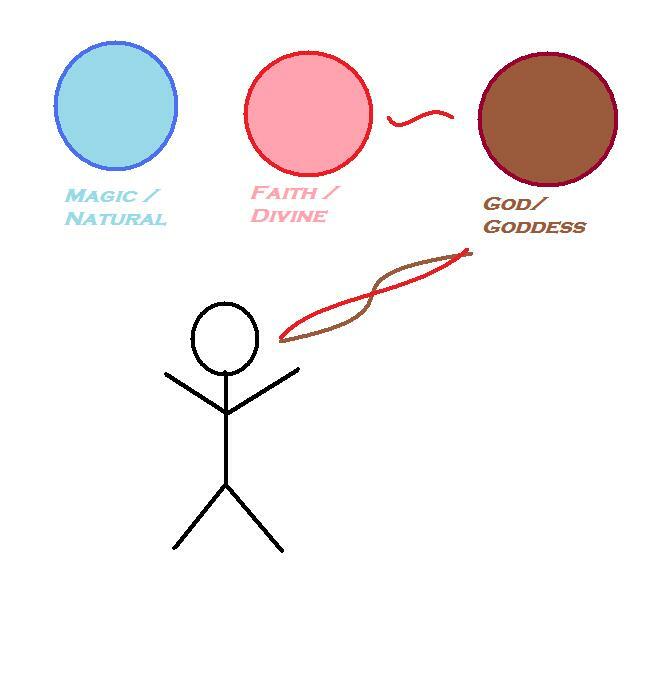 The Divinities rule over Natural Forces, indeed Natural Forces often spring up from Divinities, though Natural Forces tend to exist on their own, or run on their own, rather like Autonomic functions like the Human heart or internal organs. Humans can call forth this energy with Prayer. Excuse the terrible image, all I have is MSPaint. Well, for one, how it works. See, Humans can direct Magic from Nature into an Effect via their Will. But with Faith, Humans can’t really Direct it via their Will, at least not with magic. Because there is also the Will of the Deity that the Energy comes from is also involved. A Spell “Proclaims” an effect to come into being, and results are based solely on the Will of a single individual, and the power is taken from a “non-will” source. But a Prayer is an entreaty to a God/Goddess to basically either “borrow” their power, or to have that God/Goddess take action on your behalf. Some people occasionally get what they ask for. Others are tied in closer to a God/Goddess or Multiple Deities and has fairly free access to that power as they need it, because they have a personal relationship with that Divine Power and it trusts them to use the power wisely. A second difference is that humans give energy to magic by our existence. We’re part of the Natural forces too. But with Faith, humans actively give back to faith. As much as we might want to, we can’t really increase the amount of “Magical” energy we create, though we can learn to increase the amount we use. But Faith we can create more and more we believe in the Divine. Do not confuse this for zealotry. The quite man who lives everyday by his faith, holding his Gods in his heart, creates more Divine Energy than all the Zealots of the world. 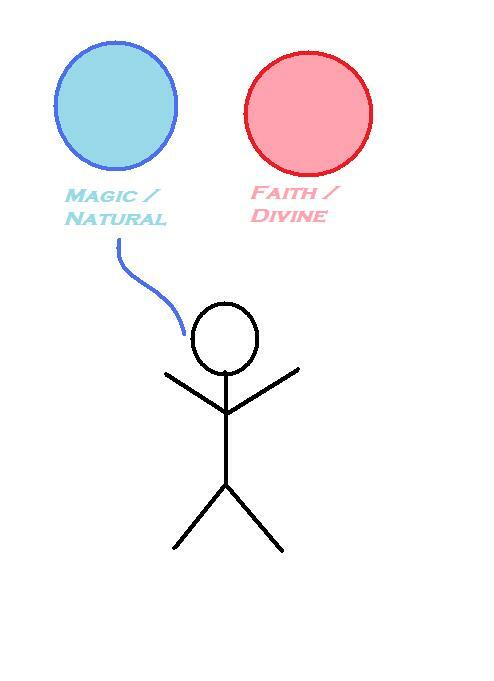 This is the fundamental Difference between Spells and Prayers. But they are also similar. Both run on Belief. The stronger your Belief in your spell, the stronger it will be. The same goes with Faith, since belief in the Divine creates Faith. You can create your own power and add it to the Prayer as the Deity adds in their own power. And the results can often be similar. A healing Spell or healing Prayer bring about much the same result. The former will either be directed by the will of the caster or by the natural forces of the body. The latter will more likely be directed by the will of the Deity or the will of the invoker. Sometimes those who use magic can do much the same with Magic by invoking a deity or spirit, though this doesn’t always mean that they are drawing on Faith, just that they are asking the Deity to guide the Natural Forces. Now, there are some people who can use both Faith and Magic. This happens more with Pagan clergy who are generally trained in both magic and the faith of their religion. Sometimes it happens with normal people, because so many Pagans are solo, though with the prevalence of Pagans to ignore the Divine or push it aside, it is exceedingly rare, by my research. 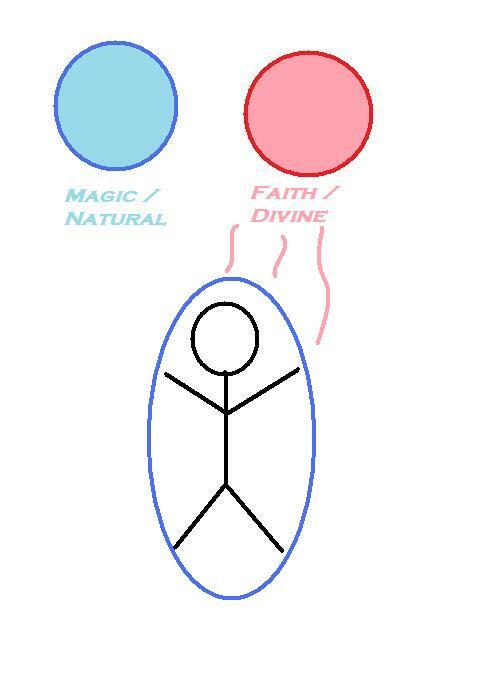 Most people tend to use one or the other, either because they have no real ability to use Magic, or because they have no real ability/desire to connect with the Divine.